2018 Idaho Spud day, brought to you by Shelley Kiwanis. More often than not, people of small towns have a knack for finding the exceptional in the mundane. They also understand what binds the citizens together. And even in today's complex, interconnected world, those binds hold strong. You'll find no better example of such authentic Americana than just a few miles south of Idaho Falls, where locals and visitors alike flock to the community of Shelley. They gather her on the third Saturday of every September to recognize our state's pride an joy - The venerable potato. 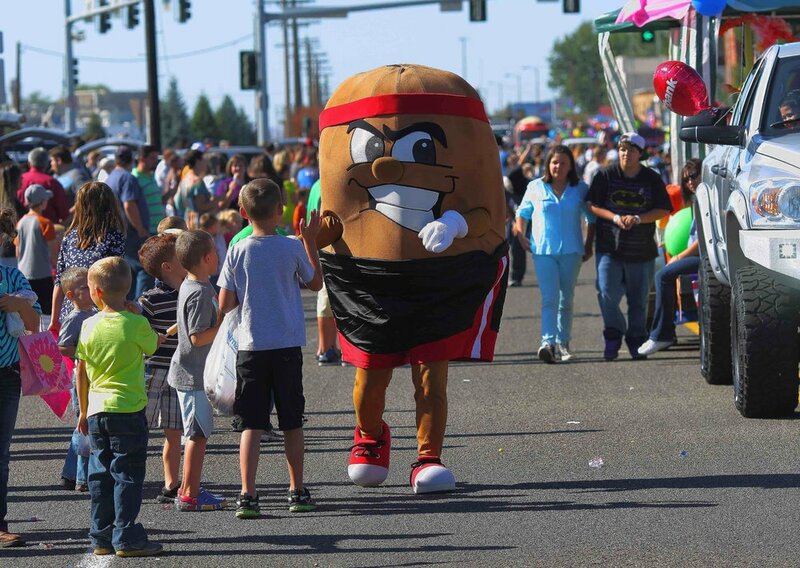 The 90 year old tradition is known far and wide as Idaho Spud Day. the 2018 Spud Day event is filled with activities and fun! Check out the schedule below to stay on top of everything that is going on. Children’s Parade (Shelley State Street) 9:45 a.m.
Community Orchestra (Park Stage – Southwest corner) 11:00 a.m.
Free Baked Potatoes w/trimmings (Southeast Park Shelter) 12:00 p.m.
Entertainment (Park Stage-SW corner of Park) 12:00 p.m. Horseshoe Tournament (NE corner of Park) 12:30 p.m. Talent Show (Park Stage-SW Corner of Park) 1:00 p.m.
Entertainment (Corner of Park) 2:00 p.m.
Spud Tug (Southeast Ball Diamond) 3:00 p.m.
Than you to our 2018 Sponsors who made this event possible. Ferguson Waterworks - Forsgren Associates - Cox's Honey - Hard Times - HK contractors - PacifiCorp - Searle Hart & Associates - Bateman Brothers Construction - Elevated Life Family Chiropractic - Hidden Treasures - Knife River - Spudnik - Sprint - Volm Bag Co. Thank you for considering supporting our annual Spud Day. support. All the proceeds listed here go to benefit the Kiwanis Club of Shelley and the community service projects they support!